Last weekend we hauled our veteran 24 Hours of LeMons racer to ChumpCar's 24 hour classic at Virginia International Raceway. The Chia-Neon was far from home facing a crowded field full of local talent and plenty of horsepower. Yet, we managed to hold our own and had a great time doing it. Full report after the jump. Piloting our green machine (in driving order) was the team of Luke Keller, Chris Baker, Chris Barber, Isaac Rife and myself, limping on a slightly broken foot. Shortly after 10am the green flagged dropped and everyone began lapping the four mile Grand Course. The Grand Course comprises nearly all of the Full Course with a jaunt through the inner Patriot Course thrown in on the back straight. I'm not exaggerating when I say this track has everything. There are increasing radius, decreasing radius, tight esses, fast sweepers, and lots of elevation changes. But more than anything else, its fast. The last time I remember using The Chia's fifth gear was at Toledo in 2008 when only second, fifth and reverse moved the car. 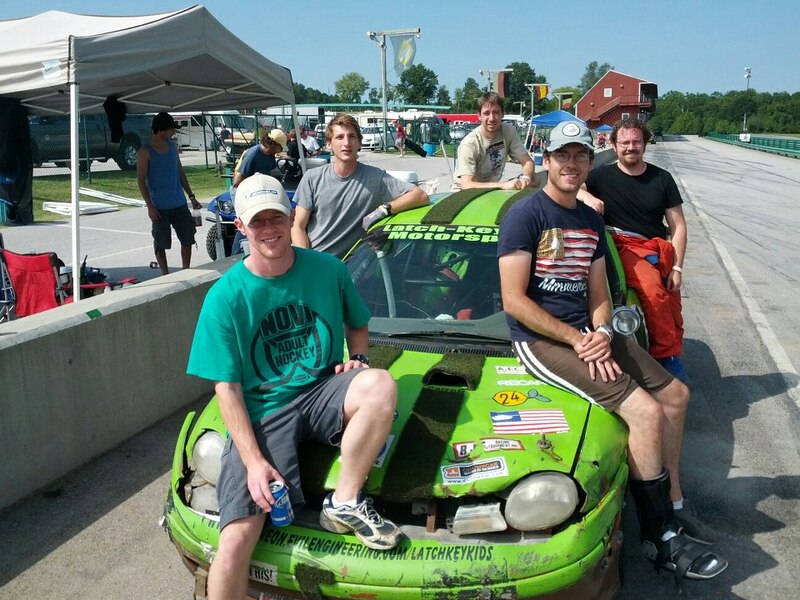 At VIR, even our humble Neon spent a lot of time at triple digit speeds running flat out in top gear. This is a big motor track. Although the Chia-Neon isn't big on motor, we used its formidable handling and brakes to move through the field. Before long we were in the top twenty and began a slow crawl up the leader board. Everyone's first stint went smoothly with each driver pitting at the mandated two hour time limit. Pit stops are also regulated to a minimum five minutes when taking on fuel. For a twenty four hour race, this makes the fastest legal strategy a twelve stint event. Unlike LeMons, the team can fuel during a driver change, although no other work is allowed. Our veteran team kept every stop within seconds of the minimum without drama. At the half way point, racing paused for thirty minutes to shorten the track from Grand to Full Course. During the break we swapped the front tires left to right and re-aimed our KC Highlighter spot lights for better vision. Racing resumed on the faster full course and slogged on through the night. The higher speeds burned more gasoline since we covered more ground in two hours and I noticed a few sputters before the end of my second stint around 4:30 in the am. After the change, the Chia drank two to three more gallons per pit stop pushing our fuel capacity to the limit. Gas was all the Chia needed to keep turning consistent laps. She ran like clock work and better than any previous race. Typically at the twenty hour mark the brakes are warped so badly I dread touching the middle pedal, and the tires feel greasy, and motor is tired. This time the Chia just kept running like it could go on for weeks. We were running just the race we want to run; clean, consistent, and fast enough. At least it went well for the first twenty-one hours. About half way through Baker's 6:30 to 8:30 am stint he got hit hard in the right rear wheel. I was sleeping in pit lane when Barber shook me awake and said the car was in. I hobbled over to pit lane as the Chia came to rest, the right rear tire having added roughly four inches of toe out. I slid under the car to have my worst fears confirmed: rear lateral link was bent badly as where the body attaching points. Icing on the cake were the attaching bolts at both ends curved like croissants. The bent bolts made removal difficult so we began swinging the twenty pound sledge in an attempt to straighten the bent link. Twenty minutes of banging reduced toe out to maybe one inch and we sent Isaac out on track to keep turning laps. Top speed was roughly 60mph or half the speed of the rest of the field and we were black flagged for unsafe pace. With no other option we went behind the wall to swap suspension parts. After spending another forty minutes off track, Isaac returned to racing able to reach speeds above 80 mph before the car tried to spontaneously spin. Baker was running a solid eighth place when he was hit. A much larger car tried to dive bomb a pack entering turn one, locked the brakes and made contact. This kind of thing happens in racing. In other events we've been the benefactor of other teams mistakes twenty hours into a race. This time, we were the team that got taken out. It was the one black spot in an otherwise smooth race. In the end we finished twenty first. Although we're disappointed another driver's mistake cost us a top ten finish, we still had a damn good time. VIR is a phenomenal track and I hope to make it back there real soon. A few people have asked me what I think about running our first ChumpCar event. A few things are different. First, there are more fast cars. I'm not sure how some of them are $500, but this is a track that rewards big motors and numerous teams showed up prepared. On track incidents are handled more like club races. We did have an occasional off track (with a safe re-entry) and its great not being black flag for little stuff. The atmosphere is also more like a club race without the spectacle of LeMons which I missed more than I thought I might. The spectacle of the Judges forcing a misbehaving team to parade through the paddock singing is damn funny as long as its not me. Overall, I'm pleased that both seem to attract strong fields so they can continue to grow the sport. I believe affordable endurance racing with street tires has a lot of potential that's unexplored by either ChumpCar or LeMons. Hopefully at least one will be willing to evolve so the sport continues to grow. A big thank you to the Anderson family for allowing us to stay in their beautiful lake house over the weekend. Matt, build a car this winter so we can race at VIR next year!